Superficial muscles of the left hand, palmar view. Abduction of the thumb by acting across the carpometacarpal joint and the metacarpophalangeal joint. It also assists in opposition and extension of the thumb. 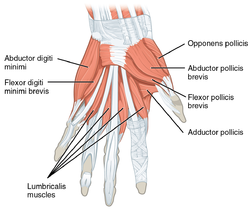 The abductor pollicis brevis is a muscle in the hand that functions as an abductor of the thumb. The abductor pollicis brevis is a flat, thin muscle located just under the skin. It is a thenar muscle, and therefore contributes to the bulk of the palm's thenar eminence. It originates from the flexor retinaculum of the hand, the tubercle of the scaphoid bone, and additionally sometimes from the tubercle of the trapezium. Running lateralward and downward, it is inserted by a thin, flat tendon into the lateral side of the base of the first phalanx of the thumb and the capsule of the metacarpophalangeal joint. The abductor pollicis brevis is innervated by the recurrent branch of the median nerve (Roots C5- C7 and C8-T1 in the brachial plexus lateral and medial cords respectively).